Big fan of: People! Bella loves everyone she meets, and she loves to play. She's happy to lounge around the house with you, but also enjoys daily running exercise. Bella likes to play with other dogs, but needs to learn to play a bit more calmly. Not a fan of: Being lazy all day. Bella has lots of energy to burn! Additionally, she isn't fond of cats. Special features: Bella is super energetic, but needs some guidance to learn to calm down. Luckily, the ASPCA offers basic obedience classes! 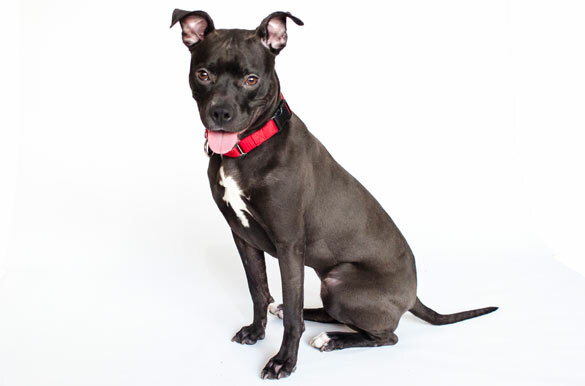 The Adoptions staff can tell you more about enrolling Bella in the class. Dream home: Bella would do best with experienced adopters who'll spend plenty of time exercising with her and training her. We think she'll get along great with kids 10-and-up, but potential adopters should bring their children to the shelter for a meet and greet before taking Bella home.